A US Navy aircraft carrying 11 crew and passengers has crashed into the sea off Japan south-east of Okinawa. 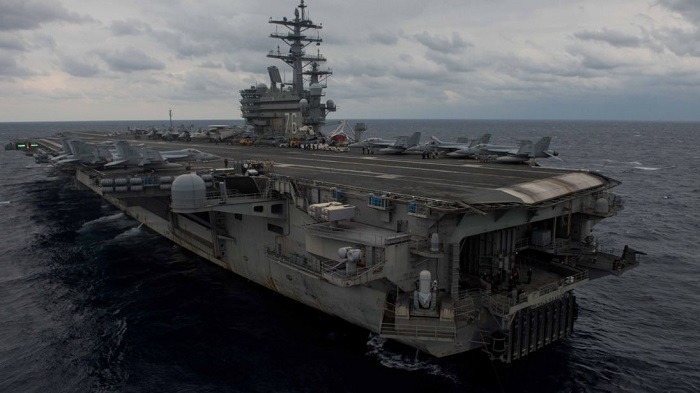 The navy said the craft crashed into the Pacific Ocean as it was travelling to meet the aircraft carrier USS Ronald Reagan. How the crash happened is not yet clear, while the names of those aboard are being withheld. Eight people have been rescued and transferred to the ship, the US 7th Fleet said in a tweet. They are "in good condition". Both Japanese and US teams are looking for the remaining three, it said. The aircraft was taking part in a joint Japan-US naval exercise that is due to end on 26 November. It crashed about 90 miles northwest of the Okinotorishima atoll. A propeller powered transport plane, the C-2 Greyhound carries personnel, mail and other cargo from mainland bases to carriers operating at sea. The type has been in operation for more than five decades and is due to be replaced by the long-range tilt-rotor Osprey aircraft. The crash follows a spate of US Navy accidents in East Asia in recent months, some fatal. 10 personnel died in August, when the USS John McCain collided with a tanker near Singapore.